Uniquely sanforized treatment prevents shrinkage and maintains the fabric's pore-size integrity through repeated washings! There are two parts to the BugShield® system: the Zipper-Lock and the Bug Blocker. The BugShield® Zipper-Lock is an auto-locking zipper that locks the zipper slide in place so that it will NOT backtrack to leave small openings that bed bugs could sneak through. The zipper cannot accidentally open. To open the zipper, the zipper tab must be pulled. 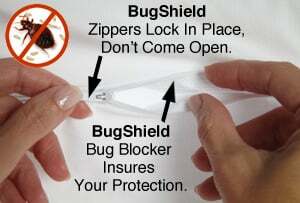 The BugShield® Bug Blocker is an added barrier that closes the last inch or so of the zipper from below to create a fabric shield under the zipper closure to doubly ensure that bed bugs will not be able to get in or out of the encasing. While most sewing manufacturers are going "off shore," we proudly make all of our allergen covers in the USA. Skilled American craftsmen and women know that the care they take in making each mattress cover is important to your health, a job they take very seriously. Each encasing is also individually hand inspected throughout fabrication to maintain top quality. We make our BedCare Organic All-Cotton allergy pillow covers to last a lifetime.